Consumers looking for a quality folding knife consider its shape, size, and best qualities related to its function and usefulness. Unlike pocket knives with multiple blades, single-blade folders solely focus on the design of one blade. These knives typically have locking mechanisms that make them more compact and sturdier when performing a variety of cutting tasks. Another advantage noted with the average folding knife is that it is usually fitted with a spring-loaded opening mechanism, allowing it to be opened quickly. 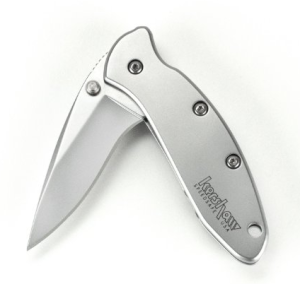 Not very much bigger than a thumb drive, the Kershaw Chive is a recurved folding blade knife that you can use to perform many tasks in your home or in the office. Weighing only 1.9 oz., this knife’s sharp, tiny 420 HC stainless steel blade is of reasonable quality and is ready to use as soon as you take it out the package. You can easily perform common cutting tasks such as opening packages, breaking down boxes, snipping zip ties and opening letters. But the knife does have its limits. It’s not the type of folding knife recommended to use to perform heavy outdoor tasks (i.e., cutting saplings) as when camping, other then lifting off the tab of a food or soda can or tightening a screw, for instance. Some users have commented that cutting hard plastic and wood is possible, although regularly repeating these actions can dull the knife’s blade faster. The shape of the knife’s blade makes it hard to sharpen. 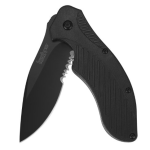 Fortunately, Kershaw offers a free mail-in service when the blade gets dull. The Kershaw Chive is not the most ergonomic knife on the market since its tiny handle makes is hard to grip. However, the assisted opening mechanism is ambidextruous and opens the blade quickly with little effort by either dual thumbstuds or an index finger flipper(preferred method). The knife has hold-close safety which consists of a tab held on a sliding track which can be used to sheath the blade when the knife is closed. 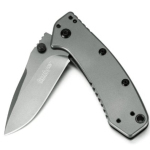 It’s advisable to use the safety if you plan to stash this knife in your pocket to avoid it accidentally popping open, and if the safety latch breaks, you’ll need a specialized allen wrench to replace it.This folding knife has a snug fitting stainless steel frame lock design that provides sturdy closure with no back and forth jiggling room. 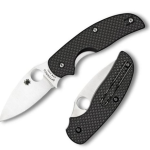 Compared to similar models, this folding knife requires more force to lock up, and has a slightly different feel. Additionally, it comes with a tip-down-only metal pocket clip fastened to the frame with 12 T6 torx screws. The main problem observed with opening this knife is that you’ll need to practice opening it while keeping your fingers clear of the blade. 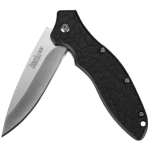 Overall, the Kershaw Chive is proportionate in size knife that has an ideal clip-to-handle tension, which holds the knife securely your pocket but is easy to draw and store away. This knife is lightweight and useful enough to quickly handle light to moderate cutting projects for both left-handed and right-handed users. The blade and blade point can take a lot of abuse before sharpening is required. Can be completely disassembled and easily reassembled for cleaning and lubrication. Locking mechanism has a clumsy feel when trying to close the blade and involves a careful maneuver as opposed to knives that have a push mechanism on their spine.